Leading the way at 31,000gns was the reserve junior, reserve overall male and reserve supreme champion Whitecliffe Highlight TI +77, SRI +73, a Blelack Digger son from M and J Hayhurst, Malton, North Yorkshire. Within the top 1% of the breed for terminal sire index and self-replacing index estimated breeding values (EBVs) and the catalogue’s highest pointed bull, this 14 month old was knocked down sold to W Kingaby, Fraserburgh, Aberdeenshire. Messrs Hayhurst, whose previous highest price at the annual sale was 6,000gns, went on to take 8,000gns from G G Williams, Llanidloes, Powys, for the 17 month old Whitecliffe Glorious TI +64, SRI +61, another Digger son, and 7,000gns for a third Digger son, the 17 month old Whitecliffe Goldenboy TI +68, SRI +66, sold to R L Riddle and Son, Hexham, Northumberland. A shared call of 14,000gns secure Westcarse Houdini TI +50, SRI +46 for purchasers R A Milne, Elgin, Morayshire, and Mornity Farms, Blairgowrie, Perthshire. Bred by J H Christie and Son, Stirling, Houdini was a 15 month old by the 11,000gns Mortimers Echo. Allanfauld Gambler TI +40, SRI +35 went for a two way bid of 11,000gns from M Massie, Ellon, Aberdeenshire, and N Barclay, Insch, Aberdeenshire. The 17 month old intermediate male champion from A Macgregor, Kilsyth, Glasgow, was by the £20,000 Elgin Davinci. Through the ring at 10,500gns was Corrie Goldmedal TI +50, SRI +40, bred by D Macgregor, Kilsyth, Glasgow. Purchased by J Herdman, Alnwick, Northumberland, Goldmedal was an 18 month old son of Elgin Davinci. The 18 month old Burradon Galaxy TI +44, SRI +45, sold for 10,000gns. By Gwenog Banjo and bred by Messrs Curry, Morpeth, Northumberland, this one went home with W R Baillie, Deerness, Orkney. The breeders invested some of their takings in the 7,000gns Brampton Helium TI +47, SRI +49, a 13 month old Newhouse Diablo son from G W Turner, Ripon, North Yorkshire. Bids of 9,000gns were made thrice. The 17 month old Blelack Digger-sired Gretnahouse Grant TI +66, SRI +62, from A G Houston, Gretna Green, Dumfriesshire, sold for 9,000gns to P M and S M Donger, Towcester, Northamptonshire. The same breeder took a bid of 8,000gns from C M Reid, Eddleston, Peebles, for Gretnahouse Gunshot ET TI +73, SRI +67, an 18 month old son of the 11,000gns Balthayock Adonis and out of Balmyle Paradise. After taking the senior male championship, Gretnahouse Grim TI +32, SRI +27, a 22 month old Thrunton Camelot son and out of a homebred Doonally New-sired dam realised 5,000gns for Mr Houston, selling to G T Wordie, Huntly, Aberdeenshire. The second 9,000gns call came from Messrs Roberts and Jones, Welshpool, Powys, for the class winner Balmyle Harlequin TI +54, SRI +43. Sired by the 9,500gns Maerdy Egret and out of a homebred dam sired by the 28,000gns Brampton Nacodar, this 14 month old was bred by W P Bruce, Meigle, Perthshire. Also realising 9,000gns was the junior, overall male and supreme champion Glencoe Hagrid sired by the 15,000gns Newhouse Diablo. This 13 month old came from V McDonald, Newry, County Down, and was knocked down sold to the pre-sale judge Graeme Massie, Aboyne, Aberdeenshire, who also invested 7,000gns in Caylers Hustler TI +49, SRI +36. This 14 month old by Thrunton Dominator and out of a homebred dam was bred by Caylers Charolais, Royston, Hertfordshire, who took the same money for Caylers Harbro TI +47, SRI +35, a 14 month old also by Dominator and sold to R Jones, Caernarfon, Gwynedd. 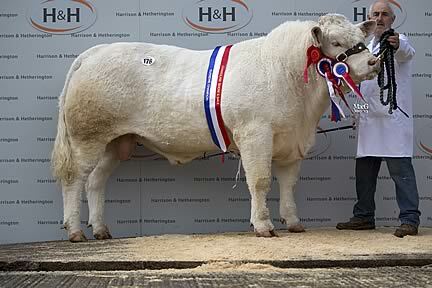 Secured for 8,000gns was Elgin Glenfarclas TI +35, SRI +39, from R A Milne and Sons, Elgin, Morayshire. The 16 month old by the 30,000gns Balymle Bollinger was purchased by J Wardlaw and Son, Balerno, Mid Lothian. Messrs Milne took a further 6,500gns for the first prize winning 18 month old Elgin Grandprix TI +42, SRI +45, again by Bollinger and sold to Auchencheyne Ltd, Thornhill, Dumfriesshire. The 20 month old reserve senior male champion Vexour Garriden TI + 65, SRI +68 sold for 7,000gns to A and C Watson, Stonehaven, Kincardineshire. By Dingle Hofmeister, Garriden was bred by J Boomars, Waldingham, Surrey. A bid of 6,000gns sold the reserve intermediate male champion Tullygarley General TI + 36, SRI +26, to E I Lewis and Sons, Machynlleth, Powys. Exhibited by G J Crawford, Maghera, County Londonderry, this was a 17 month old sired by Major. Goldies Echo TI +66, SRI +57, realised 6,000gns selling to R and D M Roberts, Abergele, Clwyd. The first prize winner from H Goldie, Dumfriesshire, was by Blelack Edition. The same breeder took 5,200gns for the 17 month old Goldies Gordon TI +54, SRI +50, by the 8,000gns Blelack Blackberet and out of a Goldies Unbeatable-sired homebred dam, to go home with J and W Menzies, Thornhill, Dumfriesshire. Knocked down sold at 5,800gns was Thrunton Gondolier TI +55, SRI +48, a first prize winner from J H C Campbell and Sons, Alnwick, Northumberland. By Balmyle Dickler and out of a Burradon Talisman-sired homebred dam, this 19 month old went home with G T and S Coghill, Birsay, Orkney. Messrs Campbell took a further bid of 5,000gns from W S L Muir, Stromness, Orkney, for Thrunton Garth TI +55, SRI +54, a Thrunton Doubletop-sired 20 month old. Realising a bid of 5,800gns was Marwood Gilbert TI +55, SRI +36, by Cottage Devon and out of a Doonally New-sired homebred dam. He was purchased by P M Rhodes, Holme-on-Spalding-Moor, Yorkshire, Gilbert was bred and exhibited by R A and J Blyth, Hartlepool, Northumberland. Calls of 5,500gns were made twice. Ugie Goldblend TI +53, SRI +44, was secured at 5,500gns by J and C O Dunn, Ayr, Ayrshire. Bred by J T Wilson, Peterhead, Aberdeenshire, Goldblend was by the 12,500gns Goldies Banker. Sold for 5,500gns to J Drinkall, Chorley, Lancashire, was Royaldowns Governor TI + 41, SRI +43, bred by M McKeown, Downpatrick, County Down. Governor was a son of the 9,000gns Goldies Carnival and out of Drumfin Damsel. The 17 month old Woodpark Goldbar sold for 5,000gns to D L and K M Porteous, Castle Douglas, Kirkcudbrightshire. 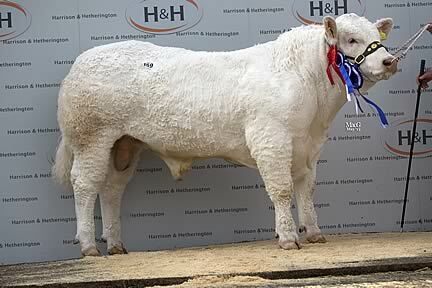 Bred by W Short, Omagh, County Tyrone, Goldbar was by the 19,000gns Corrie Alan. At the same price was Hallbankgate Hogan from I T and S E Bell, Brampton, Cumbria. 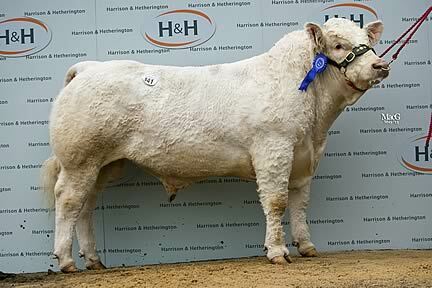 Sired by Rotoary Ferguson ET, Hogan was secured by A M and P Bowman and Son, Penrith, Cumbria. Female trade was led at 6,500gns by Holstead Faberge, TI +43, SRI +45, the reserve female champion from F, J, E and C Andrews, Huddersfield, Yorkshire. Purchased by J Hunter, Wigton, Cumbria, Faberge, a three year old heifer by Dingle Hofmeister and out of a Burradon Talisman-sired dam, was AI’d to Blelack Digger and a former first prize winner at the Great Yorkshire Show. Hamish Goldie took 4,300gns for Goldies Flute TI +57, SRI + 55, a two year old heifer by Goldies Uppermost. This one was in calf to Blelack Edition and was bought by O and J Pilkington, Buxton, Derbyshire. Jan Boomars took a bid of 3,000gns for the 17 month old female champion Vexour Glenna TI + 46, SRI +54, by Blelack Crusader. She was secured by H P and L S Whittaker, Cornhill on Tweed, Northumberland. Top price in the Hallgarth herd reduction sale, owned by R L Hall, Malton, North Yorkshire, went to the three year old heifer Hallgarth Elsie TI +37, SRI +39, for a call of 3,050gns from A J and J A Powell, Knighton Powys. Elsie, by Balthayock Ulex and out of Goldies Uniglow, was sold in calf to Rumsden Udimore with her nine month old heifer calf Hallgarth Halo, sired by Bassett Bamboo, at foot. Averages: 29 senior bulls, £4,743.10; 34 intermediate bulls, £4,887.13; 30 junior bulls, £5,736.50; 93 bulls overall, £5,116.21; 11 cows and heifers served and/or suckling, £2,744.32; 9 served and maiden heifers, £1,621.67. Hallgarth reduction sale: 5 cows and heifers served and/or suckling, £2,667; 4 served and maiden heifers, £1,824.37; 1 young bull, £1,470.